I loved this book. Yes – I LOVED THIS BOOK. From Bridget and her family, to her humor and her very real-feeling desires to ‘fit in’ and make a splash, and her staunch belief in love, it was wonderful. An inglorious entrance to the first event for this newly titled young lady shows that Lady Bridget Cavendish is no simple miss: flat on her back in the middle of a ballroom, she has the sense to make light of the moment, ostensibly finding a better angle to view the frescoes on the ceiling. I was hooked and couldn’t help but like her. Raised in America, the daughter of an Englishman who tossed away the haute ton and all the responsibilities to raise horses in Maryland, she and her two sisters and elder brother have been summoned to London to take their rightful place in society, with her brother becoming the Duke. There is a strong sense of a mix of Pride and Prejudice (Bridget’s reflections on the ‘way things are done’ as drilled into her and her sisters by the Dowager Duchess feel very similar to Jane Austen’s poking at polite society). And there is a Mean Girl, and several near slapstick blunders that Bridget makes that feel very Bridget Jones Diary. 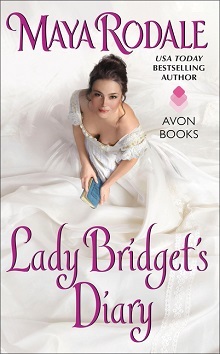 But truly, the gem in this story IS Bridget: her heart, her struggle to fit in and change herself to fit some mold, and the uptight, nearly straightjacketed and veddy veddy propah Lord Darcy. So Darcy does bend as much as a two by four in a toddler’s hand, but as we get to know him, and see just how difficult it was to be raised to ONLY the Duke, he starts to appeal. Even more intriguing is his inability to recognize and understand that he is not only intrigued by but NEEDS someone like Bridget in his life……. There are too many moments to love in this story: from the good natured teasing and honest appraisal that Bridget makes of Darcy from her limited experience, to her constant teasing of him, her desperate desire to fit in contrasting with the realization that she won’t, and the lovely insets of the siblings as they all have different (and often humorous) observations and asides about the way things are done. 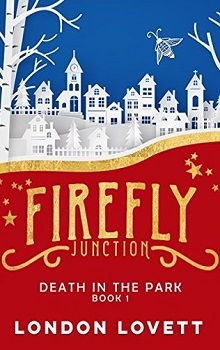 This is a fun and lighthearted story that occasionally borders on the unrealistic but never loses the joy in the journey. The perfect pick me up read when things just aren’t falling into place. Bridget and her family will make you laugh, think and smile and Darcy’s stumble through the minefield that is emotions is a wonderful ride. A copy of this title was provided via Avon Addict for purpose of honest review. I was not compensated for this review: all conclusions are my own responsibility. One would think that having one’s brother inherit a dukedom was a stroke of good fortune that would transform their lives from ho-hum to utterly fantastic. One would think that until one was on a reducing diet, stuffed into a tightly laced corset, and forced to practice walking backward. “Once again, Lady Bridget,” the duchess said crisply. She was Lady Bridget Cavendish now. Before she had just been Bridget Cavendish of Duncraven farm in Maryland. But then a letter had arrived one day, with the unexpected news that James was now a duke and they were all to leave everything behind and travel to England, immediately. “Yes Lady Bridget, once more please,” Amelia said with a smirk. “Do shut up, Amelia,” Bridget said, under her breath. Younger sisters were quite annoying, on any continent. “It’s ‘Do shut up, Lady Amelia,’” Claire, the oldest sister, corrected. She found all the formality as ridiculous as the rest of their family, much to the despair of the duchess. Somewhere about the massive house—probably in the stables, even though the duchess made it perfectly clear dukes were above mucking about in the stables—was her brother, James. Or, as he was now to be known, His Grace, the Duke of Durham. Dukes had many responsibilities, it seemed, but walking backward in a gown with an excessively long train was not one of them. Before her, with sharp blue eyes and perfectly coiffed blond hair, was Josephine Marie Elizabeth Cavendish, Her Grace, the Duchess of Durham, widow of the previous duke, and aunt to the Cavendish siblings. One did not call her Josie. Amelia had asked. “Remind me why we are learning to do something as ridiculous as walk backward?” Claire asked. From a young age, she had spent her free hours devoted to the study of mathematics, otherwise known as Important Work. Bridget’s head ached just to think about it. “What if we do not wish for a husband?” Amelia asked. At the duchess’s request, Bridget sank into a curtsy. They had practiced this extensively on Tuesday afternoon. Then, with as much grace as she could muster, Bridget rose and began to elegantly glide backward. Or so she tried; feats of grace did not come easily to her (a point upon which their dancing instructor would absolutely agree). Nothing about being a True Lady did. Bridget had daydreamt through lessons on the order of precedence amongst members of the haute ton, how to properly pour a cup of tea, and all the other lessons on etiquette and deportment they endured morning, noon, and night. While the duchess’s attention was focused on her sisters, Bridget took advantage of her distraction to continue walking backward until she had crossed the length of the ballroom, then she continued through the large double doors and halfway down the corridor, at which point she turned, lifted her skirts, and proceeded to the kitchens. Reducing diet, deportment lessons, and True Lady-ness be damned.